Helida Montrond, 18, a student at the Benjamin Franklin Institute of Technology, spoke at an event announcing the college is joining a Boston program that offers free tuition to low-income students. 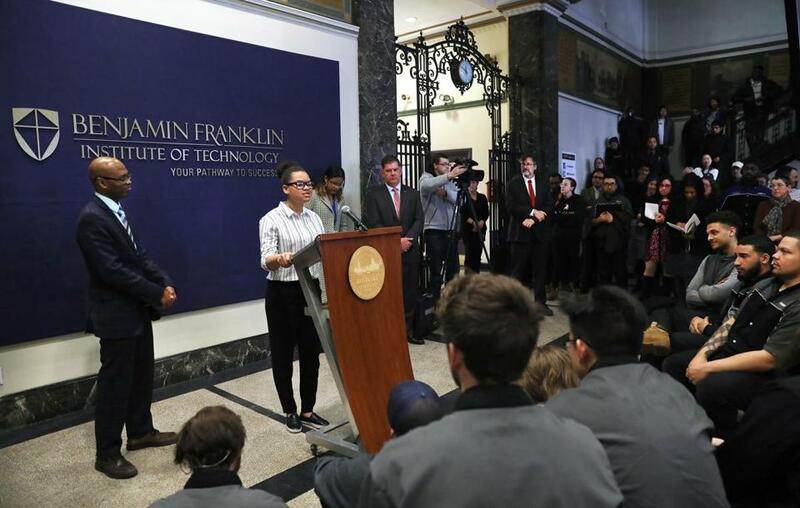 The Benjamin Franklin Institute of Technology has become the latest local college to join a city program that offers low-income Boston public school graduates free tuition, Mayor Martin J. Walsh announced Wednesday. The Tuition-Free Community College program lets students attend the partnering colleges at no cost if they maintain a 2.0 grade point average and enroll a year after obtaining their GED. At a news conference at the South End school, students praised the partnership. Helida Mondrond, a Dorchester resident and a senior at Jeremiah E. Burke High School, said a free associate’s degree would help her family immensely. She already takes classes at Benjamin Franklin through its dual enrollment program, and next year she’d be among the first cohort to benefit from the deal. The program kicks off this fall and is open to both current students and incoming students. It will be funded by the Neighborhood Jobs Trust, which collects linkage fees on large commercial developments in Boston. 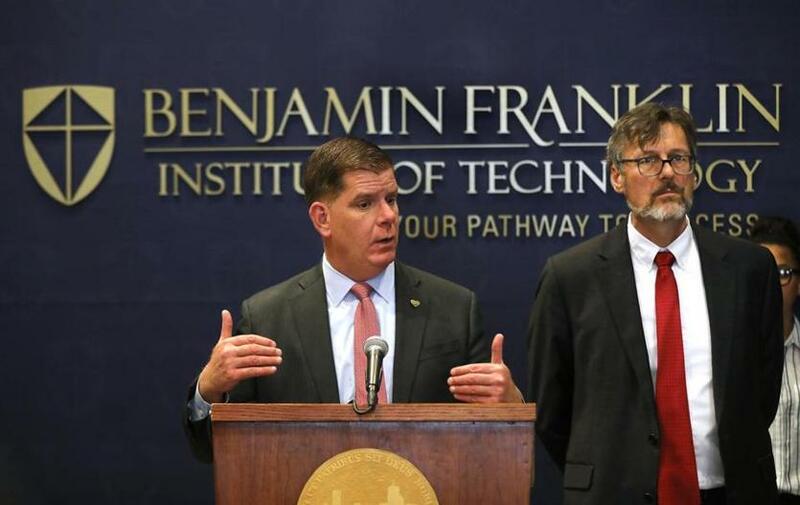 Boston Mayor Martin Walsh and Tony Benoit, president of the Benjamin Franklin Institute of Technology, spoke. The free college program aims to help people with diverse and low-socioeconomic backgrounds. Benjamin Franklin says 93 percent of its students receive federal aid. “One way of addressing these issues is by making sure people have opportunity to education and good paying jobs,” Walsh said. Benjamin Franklin, founded in 1908, is a small, private nonprofit college that focuses on technical career education. In January, the school announced plans to sell its century-old building and look for a new modern campus in Boston. The college is the fourth overall and the first private school to join the program, which was launched in 2016. Other participants are Bunker Hill Community College, Roxbury Community College, and MassBay Community College. There are 316 participants in the program to date. Walsh said he hopes the program will expand statewide. Annika Hom can be reached at annika.hom@globe.com. Follow her Twitter at @AnnikaHom.